All of the beauty and order of the preceding pictures should be seen against the many piles of debris found everywhere in the area. Many homes have been leveled - some by the storms, some by bulldozers. 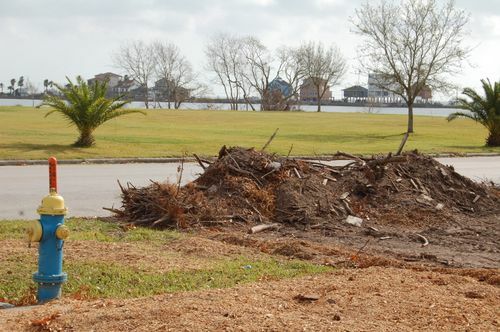 We estimate that about half of the structures along the storm ravaged coastline surrounding Kemah are in disrepair. Yet... repairs are being made. We heard hammers pounding and saws grinding throughout the three days that we were in the area. Wrecked and ruined yachts and sailboats can be seen along every roadway in the area, left where they landed or bulldozed aside after the storm. Surely some were salvaged, but evidently the ones remaining were not worth claiming.